About Translation: Why this love affair with Notepad? I'm doing an on-site linguistic QA of some complex software. This is often frustrating: programs that don't work, crash, get disconnected. These annoyances come with the job: you wouldn't QA software already in perfect shape (during linguistic testing, we often discover many functional bugs). One thing that particularly exasperates me, however, is the program supplied for accessing some of the reference material. The references are a set of tab-delimited files. We search in these files when we find a problem in the localized interface: inconsistent translation, mistranslation, etc. 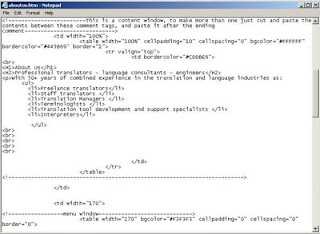 Unfortunately, the tool used by this (major) translation company is Notepad: with it, we are supposed to search within the files, identify all the relevant strings, and copy them to a bug-tracking database. 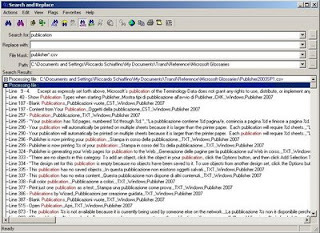 To search multiple files, we would open several different instances of Notepad, one for each file. To identify multiple strings or substrings, in Notepad there is no other way but to search, find the first occurrence of a string, and search again, until we get to the end of the file. Notepad is not suitable for this: more specialized tools are much better. 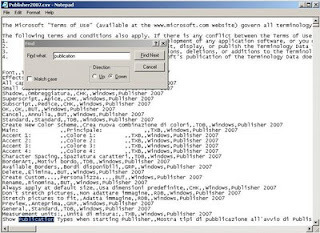 I would suggest Funduc's Search & Replace or ApSic's XBench: they allow searching on all files at once, display all the hits at the same time (in a more legible way), and permit more sophisticated searches, with regular expressions (Search & Replace) or with the "Power Search" feature of XBench. (In fact, with the test lead permission I at once installed XBench and started working with it). In many QA projects, editing is part of the job. 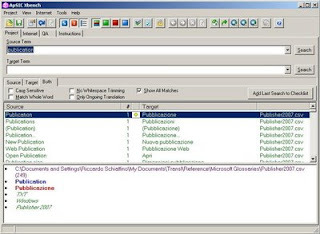 Again, Notepad is often the program provided: using a text editor ensures that no extraneous elements are surreptitiously added to the text file (as would happen easily, with a word processor such as MS Word). The disadvantage is that Notepad offers no good search functions, no syntax highlighting, no code folding, and so on. 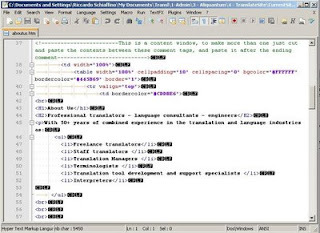 Even if the translation company doesn't want to provide Ultra Edit or other high-end text editors (because of the cost involved, or the steeper learning curve), there are many excellent free text editors. For such tasks, for example, I use Notepad++.